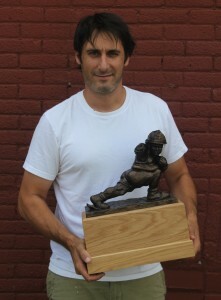 The firefighter’s fantasy football trophy is completed. I’m proud to say that I finally finished a custom trophy that I’ve been thinking about for some time now. A fantasy football trophy specifically for firemen. 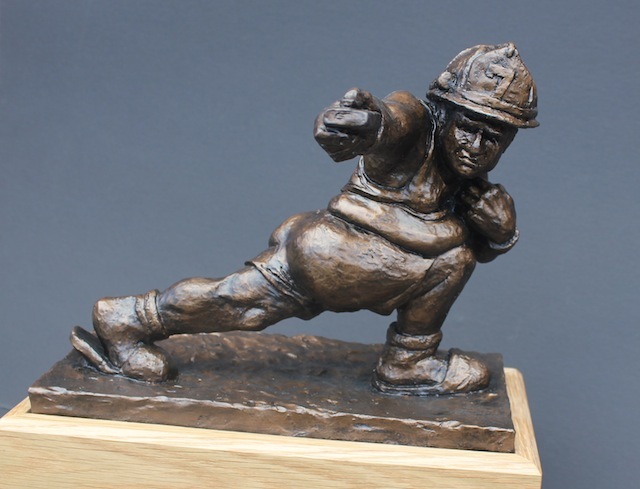 I’ve had a few requests over the years to sculpt a trophy that would represent firefighters, but I always had to put doing it on the back burner. However, when I received another request from an engine company down in Florida, I couldn’t put it off any longer. It was time to sit down and custom make a fantasy football trophy for the bravest among us. Since the firehouse loved the Throwback so much, the decision was made to sculpt a helmet onto the existing sculpture. After grinding down a large portion of the leather helmet and neck roll on a standard Throwback, I was then able to add the firefighter’s helmet to the figure. The really cool part was also being able to personalize it by sculpting the #7 on the front to represent the firehouse. Overall I’m thrilled at how it turned out and can’t wait to hear their reaction. I’ve been promised that photos will be on their way after they receive it. If any other firehouses are interested please contact me at Dave @ FantasyTrophies.com.